Jesse was runner up in the Design category. He designed a cover for the fictitious book End Hunger Now: How The Policies You Support Can End Hunger, published by the International Food Policy Research Institute. The book focuses on actions we can take to create systemic change that will affect world hunger, specifically via economic policy. Jesse used a dark blue/beige colour scheme and restrained typography to convey a government feel, along with collaged extracts from policy documents. 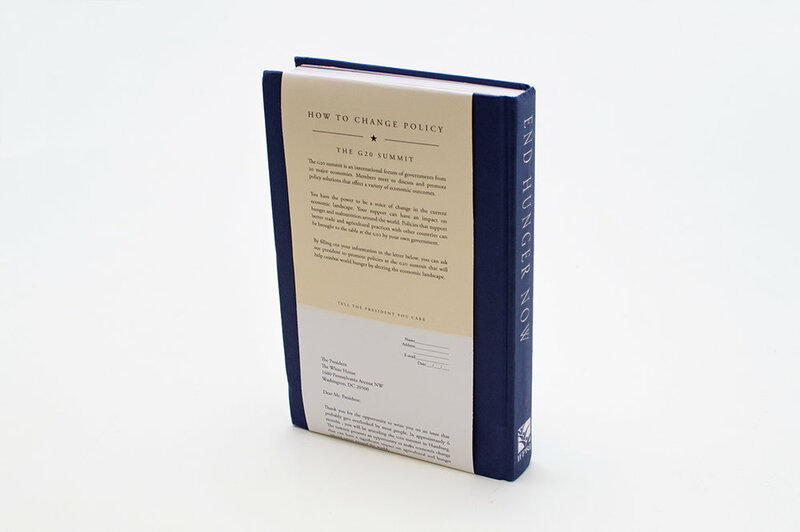 The apple-shaped die-cut balances the serious feel, and connects the reader to the idea of hunger issues changing through policy. The back of the book prompts readers to take action by signing a pre-written letter addressed to the President. The letter asks that specific policy issues pertaining to world hunger be addressed at the upcoming G20 summit, where world leaders meet to deliberate economic policy. Task: Almost 800 million people in the world don’t have enough to eat. The purpose of your task is to choose an NGO (non-governmental organization/not-for-profit) and help it to raise awareness of the affect of hunger in a chosen community in the world by providing a call to action. For example, a student in Winnipeg might choose to address hunger on local streets and select Winnipeg Harvest as their NGO. A student in Vancouver might choose the NGO called Farm Africa with the hopes of tackling issues abroad, like the development of farming communities in Africa to combat poverty. Further research on the theme will likely be required to develop the strategy and ultimately the execution of your chosen assignment. Applied Arts is Canada’s premier magazine of visual communications. Since 1986, we have delivered gorgeous imagery, strong opinion, timely information and essential industry insight to our readership of creative and marketing professionals. The Georges Haroutiun Scholarships were established in 2016 to mark the magazine’s 30th anniversary. The program is named in honour of Applied Arts’ founder Georges Haroutiun, a notable graphic designer who launched the magazine in 1986 as a way to connect with industry professionals and celebrate Canadian creativity, both established and emerging.